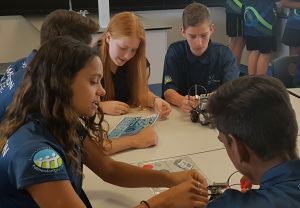 Our C4E AIM program provides high academic ability students from Years 7 to 12, aspiring towards careers in multiple industries, with an engaging, enriched, inquiry based and accelerated learning environment. Students are challenged and extended to Achieve with likeminded peers who are Inspired and Motivated learners for success now and in the future. Our students develop higher-order thinking skills and deeper study into areas of choice, building their knowledge to AIM for the highest Australian Tertiary Admissions Rank (ATAR). 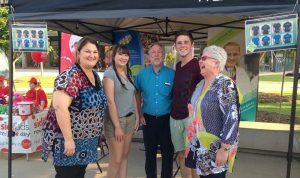 Palmerston College has many partnerships to support the diverse needs of students, staff and families with local, national and global. We strongly believe in working with our school community to improve outcomes for our students and have developed strong partnerships to enable this. Our past students, families, staff and community will always part of our Alumni. The Palmerston College infinity symbol AIMS to show always remaining connected to our community and PROUDLY embraces our connectedness with our students, our staff and our INFINITE successes and learning pathways. The smaller to larger elements within our logo illustrates students working towards preparing for their future from Years 7 – 9 and continuing to succeed in Years 10 – 12, as well as student’s knowledge expanding and continuing to more GLOBAL. Coming in December 2017 will be our Palmerston College and Palmerston City School Alumni. 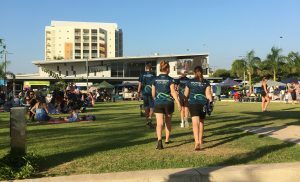 Our students have opportunities to broaden their minds and experience culture first hand by looking at the world beyond the Northern Territory. 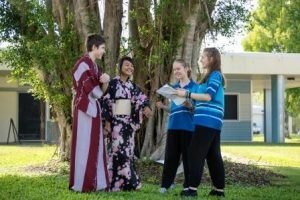 Students can participate in a number of interstate and overseas tours with a cross-curriculum focus on culture, history, and language. Our sister school partnerships also give all involved new educational experiences and forge new friendships.